Forget what you’ve learned. The Pinbar trading strategy isn’t what you think. I once believed the Pinbar trading strategy was the “holy grail” of trading. All I needed to do was, spot this trading setup, enter the break of the Pinbar, set your stops, and make consistent profits every month. So, I started looking through the charts for a Pinbar. On the daily, 4-hour, and 1 hour and even 5 minutes timeframe. I got nowhere, really. Sometimes I won, sometimes I lost. The bottom line is, I didn’t know what the heck I was doing. And it’s not until I learned how to read price action of the markets, that everything started to make sense to me. Now, if you are trading Pinbars and not getting the results you want, then today’s post is for you. A bullish Pinbar shows rejection of lower prices. The lower wick shows the bears were in control earlier but was eventually overcome by the bulls. A bearish Pinbar shows rejection of higher prices. The upper wick shows the bulls were in control earlier but was eventually overcome by the bears. The Pinbar is usually a retracement on the lower timeframe. If you’re trading the Pinbar by itself, then what you’re doing is trading against the trend on the lower timeframe. Now, I’m not saying the Pinbar trading strategy doesn’t work. But you need other factors of confluence to make this work out (more on this later). An uptrend will not reverse just because there’s a bearish Pinbar on the chart. It takes much more than a single candlestick to reverse a trend. Heck, even a major news release has difficulty reversing a trend, what more of a Pinbar? If you spot a Pinbar against the trend, watch what happens next. The odds are the trend will continue. Earlier, you’ve learned the Pinbar represents price rejection. Price rejection can come in different forms (and patterns). If you focus only on the Pinbar, then you’ll miss lots of trading opportunities. My point is… stop memorize chart patterns. Instead, learn to read the price action of the markets. An invaluable skill that lets you better time your entries and exits. Once you’ve learned it, you’ll never need to memorize another pattern again. What happens before the Pinbar is more important than the pattern itself. Because it tells you who’s in control and whether the price rejection is significant or not. If you see strong momentum followed by a small bearish Pinbar, it’s likely to be a pause (as the bulls are in control). And if you see weak momentum followed by a huge bearish Pinbar, it’s likely to be a reversal (since the preceding price action tells you the bulls are getting weak). So… don’t treat all Pinbars the same because they’re not. Remember, the bigger the Pinbar (relative to prior candles), the stronger the price rejection. This is the easiest way to turn a losing strategy into a winning one. If you’re buying groceries, you know how much you’re willing to pay based on your past experiences. Anything above value, you’ll not buy it. But in trading… how do you identify value? This is when Support and Resistance (SR) can help you. You can have a bullish Pinbar that is a retracement against the trend (on the lower time frame). And this results in a low probability trade. If you spot a bullish Pinbar, then wait for a higher high to form (on the lower timeframe). If you spot a bearish Pinbar, wait for a lower low to form (on the lower timeframe). By waiting for a break of structure on the lower timeframe (in this case a lower high and lower low), you’re waiting for the price to confirm that sellers are in control before taking a short position. And this increases the odds of the Pinbar working out. Earlier, you’ve learned that the larger the Pinbar relative to prior candles, the stronger the price rejection. You can measure the range of the Pinbar against the average true range (ATR) of the market. If the range of the Pinbar is at least 1.5 times the ATR, then it’s considered large. So if you get a Pinbar at least 1.5 times the ATR, then it’s telling you there’s conviction behind the move. Let’s put what you’ve learned and developed a Pinbar trading strategy. What are the conditions of your trading setup? How will you enter your trade? Where is your stop loss? Where is your profit target? How will you manage the trade? If 200ma is pointing higher and the price is above it, then it’s an uptrend (defining the trend). If it’s an uptrend, then wait for the price to come to your area of value (it could be SR or dynamic SR). If the price comes to an area of value, then go long when you see a bullish Pinbar (or price rejection). If you’re long, then place a stop loss below the low of Pinbar. If the price goes in your favor, then take profits at the nearest swing high. These are important questions you must ask yourself — and there’s no right or wrong because we have different personality and risk tolerance. Ultimately, you must find something that suits you best. In strong trending markets, the price is unlikely to pullback towards SR. Thus, you can look to trade from the moving average. What are some of the things you look for when trading the Pinbar? Thank you so much for teaching great and practical stuff that is easy to understand and apply. These will definitely increase one’s winning rate. Glad to hear that. Keep it going bud! Glad to hear that, Antonio! Thanks for sharing the details of this strategy, Rayner. I especially appreciate what you’re saying about avoiding pinbars that are retracements on a lower time frame – that’s a smart distinction and a good entry filter to add. For me, the most important thing is going with the long-term trend. I find that having this wind at your back can really help (as I’m sure you know). Thanks again for the actionable tips. You’re most welcome. yes, the long term trend is definitely something to trade with! Thanks for pointing out. I’ve edited it. Thank you Rayner. This is very helpful. Great article. I don’t really get pin bars and have never really payed attention to them at all, let alone use them in my trading. I don’t know if I will now, but tks to your article I understand more about them. Glad to hear its helping. More excellent teaching with an appropriate EMPHASIS on rules and discipline. Keep up the good work. Really enjoy your weekly videos. Excellent article Rayner. Enjoy your articles. Improves my understanding of technical aspect of price action. Real glad to hear that. Best! Rayner, excellent read and video. You explain things so clearly and simply reflecting expertise and experience. Great article as always. 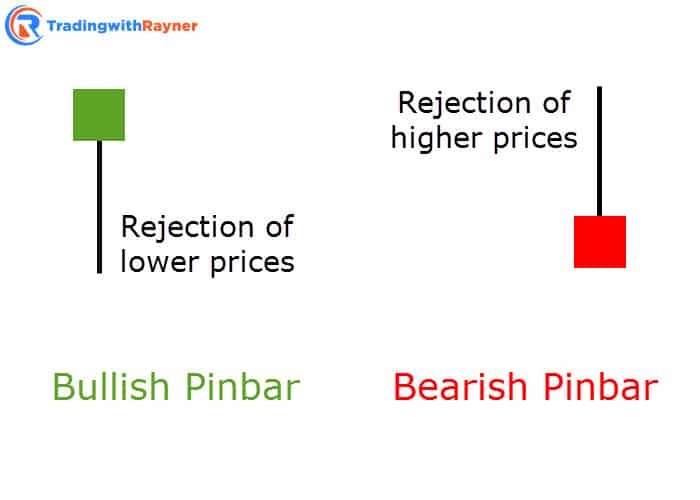 In the definition of Bullish pinbar & beraish pinbar the images shown look like hammer & inverted hammer. Can we consider a hammer as pinbar aswell ( as both signal price rejection. Also apart from Support Resistance, in addition is there any other indicator which gives confirmation of a possible trend change . I agree it looks similar to the hammer. In fact, I suggest taking into context of the markets you’re trading, irrespective of the candlestick patterns you’re trading. 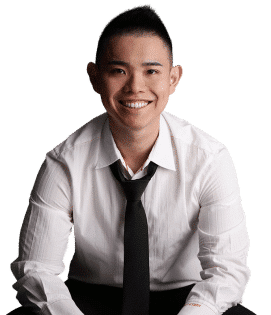 Hi Rayner , Thank you posting all these educational videos for reatail trader like me .You have very simple presentation about the market . Don’t mention it. Glad you found it useful! I’m glad to hear that. Don’t hesitate to let me know if you’ve got any questions, I’ll be glad to help. Hi Rayner, thanks for the lesson on pin bars, really good. Glad to hear that, Mav! R:R has been a real pain in my trading because i was too excited when trading but after viewing your vedio a couple of times i made some serious reflection on my previous trading and i hope to make it a point to fpllow your advice seriously from now on. Do keep me updated on your progress. Thank you for this Lesson. Very helpful to keep reminding our self this knowledge. can this be used to scalp the futures mkt? Rayner, you always advocate letting your winners run and getting into the big trends etc but then often I see you placing your TP at the previous swing point, this seems like a major contradiction to your philosophy, or are you just taking partial profit? I have 2 trading approach, Trend Following and swing trading. For Trend Following, I ride my entire position. For swing trading, I tend a portion off at swing high/lows areas. Can you explain furthermore details about this part brother? For a bullish pinbar on a higher timeframe, the lower timeframe will show a series of lower highs and lows. What you’re looking for is for the price to break higher and form higher highs and lows (on the lower timeframe). You’re welcome, Phil. Glad to hear that! Great training!, what about in major trading ranges?Daily or weekly basis? These areas can last weeks or months and are often tradable events when recognized. Sure, you can use those levels as part of your trading plan. Thanks my friend,really open my opinion about trade the pinbar,ur vedeo are simple yet lot of knowledge I can gain from it,one more thanks my friend ur really help retail trader like me.. Thank you Sir Rayner. Very informative. I’m from Zimbabwe yes i try by all means to understand the candlesticks but hey my thick skull is not getting it can you please help me i’ve downloaded your book trying to read it. I didn’t understand the part where you showed charts with labels stating winning trades and losing trades. Can you elaborate what you mean by those? and where did you enter? What does those boxes refer to? and how can that be a losing or winning trade? The blue box is where the entry trigger occurred. The arrow is the level to take profits. Huh? Then why is it on the left of the box (the entry part) ? Isn’t it supposed to be on the right? Because I’m explaining where I’m looking for possible targets, which is on the left side (the swing low). How do we know which stock is going to form pinbar, how to sort the stock for the next day for pinbar strategy. Just look through the charts after the market has closed and you can manually hunt for these price patterns. The location of pin bar is fundamental issue. I like to enter 75 % retracement of a pin on interesy ING area. It gives very good RR at least 1:4. Disadvantage is fact that we will miss some movements. i need to know if 200MA is suitable equally on both 4h and 5min chart? The concept can be applied the same. Hello Rayner. Thanks for the blog. I just want some clarification. Please what type of Moving Average do you refer to when identifying a trend? Is it the Exponential Moving Average? Or Simple Moving Average? Or another? It doesn’t matter what type of MA calculation you use, the concept is what matters not the settings. I generally use the 200ma to define the trend, whether it’s sma, ema, wma, is not important — the concept is.